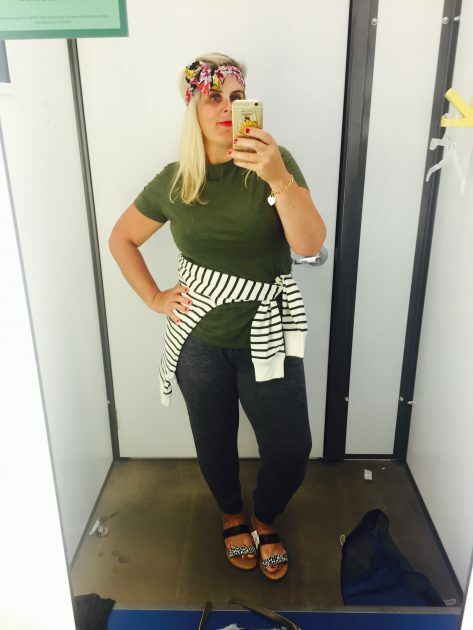 Yummo Mummo | 5 clothing items, 7 outfits. BOOM. You know little ol’ me….. I love to play with style. Finding multiple ways to wear a neckerchief is my JAM. 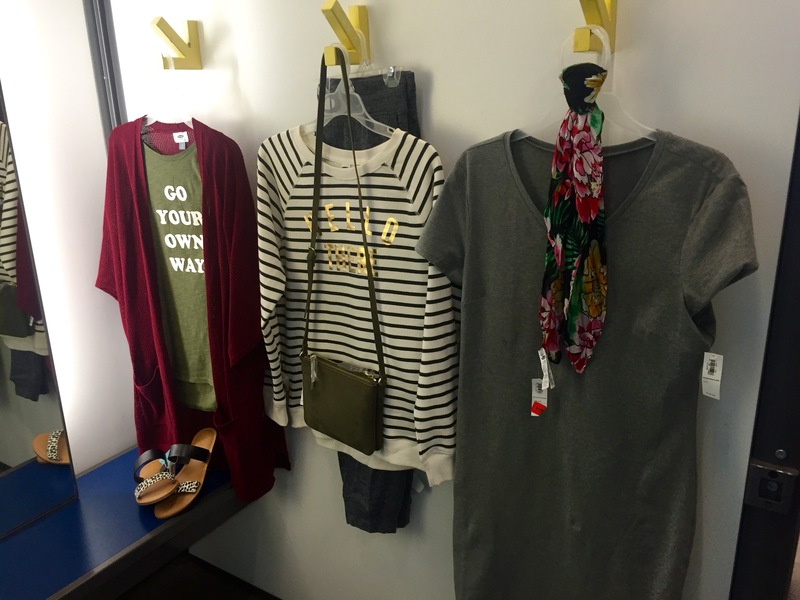 So I took myself into my local Old Navy, pulled some items, and got creative in the change room! Yeah, I know, that’s more than 5! I said 5 “clothing items”. Of course we need to add accessories! 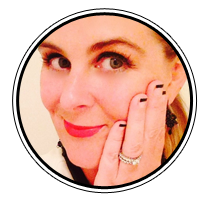 Here is 7 days of outfits – – you won’t need to think what to wear for an entire week — yippee to that! OUTFIT 1. 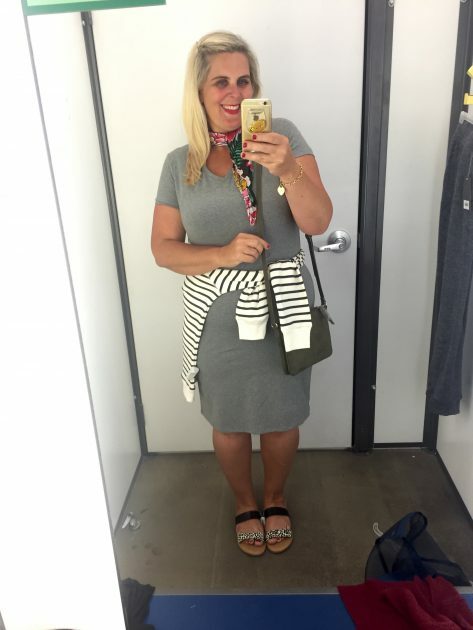 A body con dress can make anyone feel a little conscious — that’s why it’s called a body con! 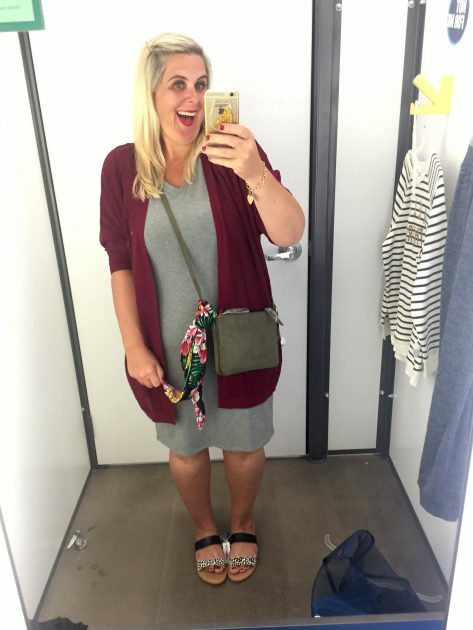 Throw on a long cardigan and a cross body bag to cover the mid section if you’d like a little more coverage for comfort! OUTFIT 2. I’ve continued the midsection “coverage for comfort” by adding a striped cotton sweater, but tied to the side for a little something-something in the interest department. Also a great chance to play with mixing patterns — floral neckerchief at the neck, and animal print shoes at the feet. Stripes are universal, and mix beautifully with patterns. OUTFIT 3. This oufit was comfort with an A+ in the cozy department. 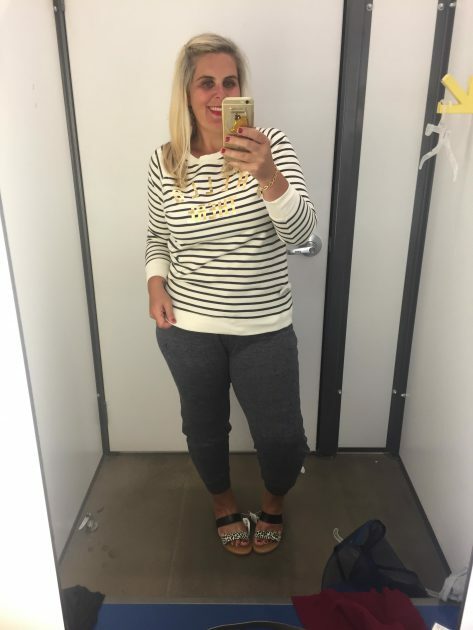 I could live in joggers, and this striped sweater with the words “Hello There” would be a great conversation starter — see what I did there? Again with the slides — think outside the box with joggers, it doesn’t have to always be tennis shoes! And more of that playful mix with patterns. OUTFIT 4. By “Go your own way” I mean, YOU DO YOU, my loves! Olive green is a great color to pull into most outfits, and if you havent noticed, military green jackets are HOT this season. I’ve tied the burgundy cardigan to my side waist, that fun side tie again! And finally, that neckerchief is a hair tie, for those days we girls just want to have fun. OUFIT 5. 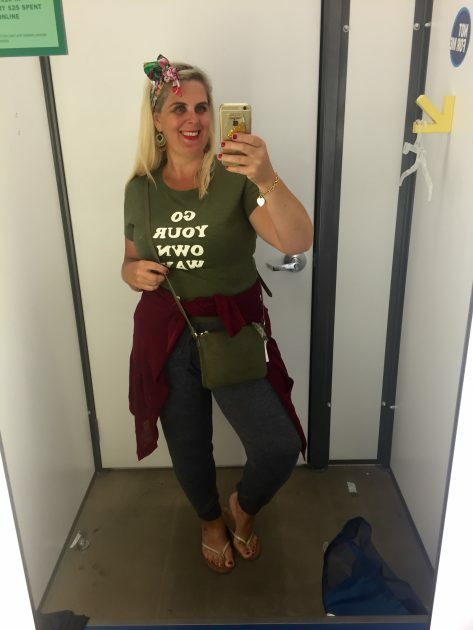 An olive green slogan tee has been turned around for a solid look. And notice how those slides tie into each outfit perfectly, who would have thought?! 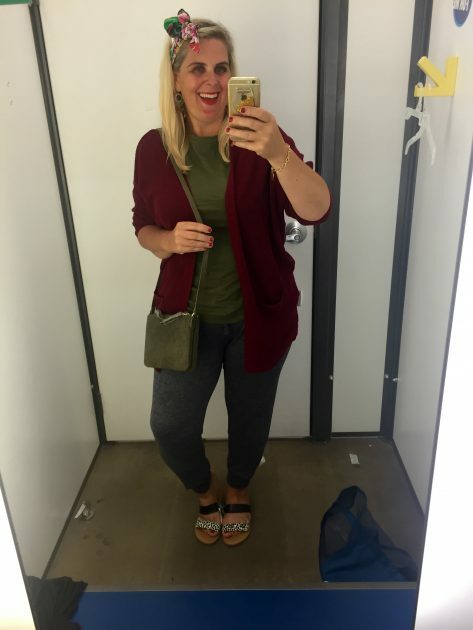 I love burgundy with olive, and the colors of the hair tie pull the outfit colors in. OUTFIT 7. I don’t know why, but I’m feeling a little badass in this little number. Must be that wardrobe power I am forever going on about! 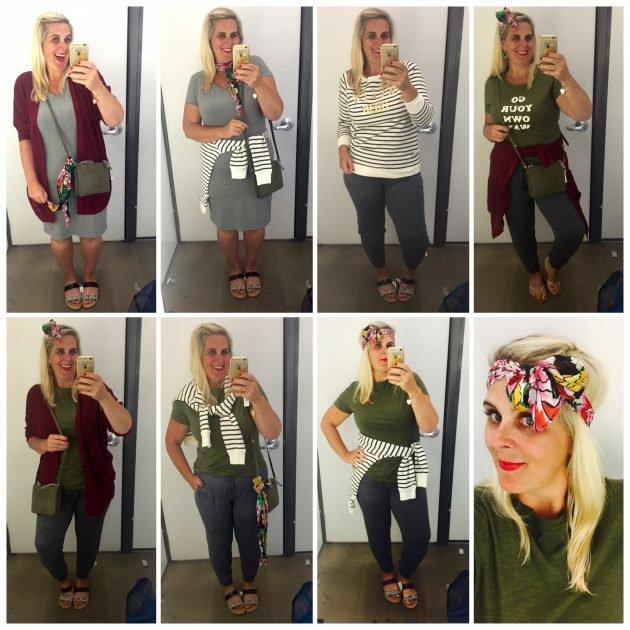 Outfits 1-7. So much fun to put together! Which outfit is your fav? I’d love to hear in the comments below! Ok you just make me smile! Your post shows with a little budget + a little creativity, a smile, and a sense of humor, fashion can be so much fun! 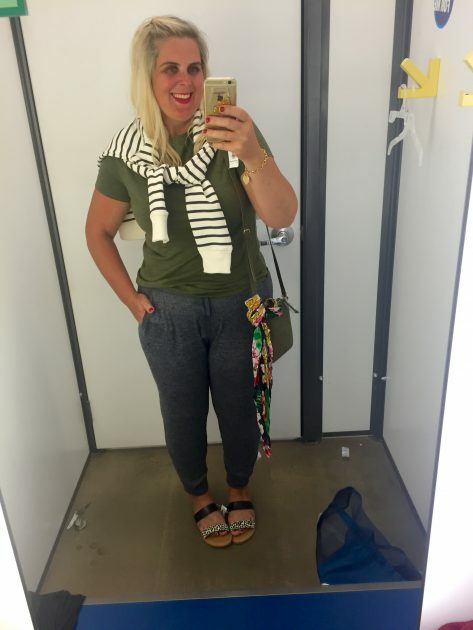 Great everyday looks for us moms on the go!